Please bear with us as we migrate this and other content to the Microsoft Azure website. This topic is no longer being updated and might become out of date. Please bookmark the updated Azure article on this subject, Add company branding to your Sign In and Access Panel pages. Company branding is a feature that is available only if you upgraded to the Premium or Basic edition of Azure Active Directory. For more information, see Azure Active Directory editions. Azure AD Premium is not currently supported in China. Please contact us at the Azure Active Directory Forum for more information. 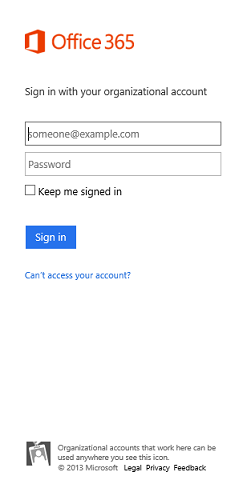 Sign In page - This page is where users are redirected when they are signing in to Office 365 or other web-based and modern applications that use Azure AD as your identity provider. Most users will interact with this page whether it’s to go through Home Realm Discovery, which allows the system to redirect federated users to their on-premises STS (such as AD FS), or to enter their credentials. 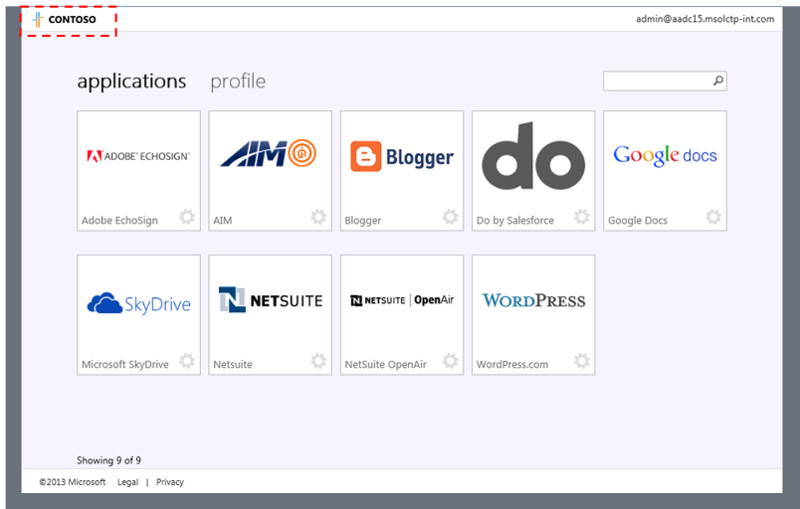 Access Panel page - The Access Panel is a web-based portal that allows an end user with a work or school account in an Azure AD directory to view and launch cloud-based applications to which they have been granted access by the Azure AD administrator. The Access Panel is accessible to all users in your organization at myapps.microsoft.com. The Sign In page is typically the most frequently used web page by end users that need browser-based access to the cloud apps and services that your organization subscribes to, so making sure it looks right is paramount. If you want to use the default non-branded Sign In page experience, you need do nothing. How long does it take to see branding changes on the sign in page? It can take up to an hour for users to see any new change you made to the sign in page branding. 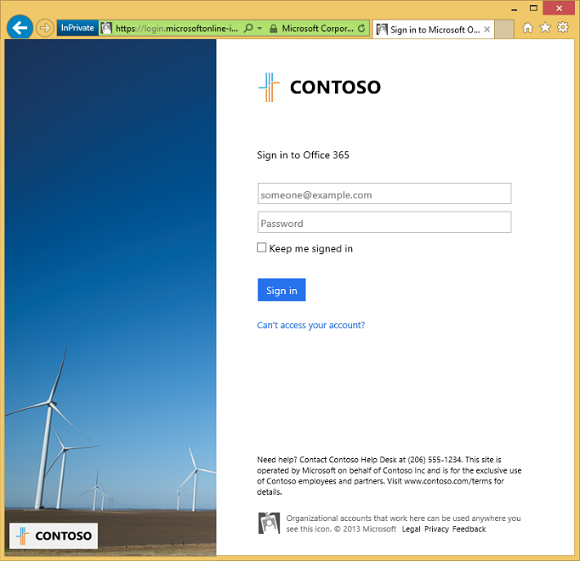 When will users see a branded sign-in page? User will see a branded sign in page when they visit a service with a tenant-specific URL such as https://outlook.com/**contoso**.com, or https://mail.contoso.com (if you’ve created a CNAME). 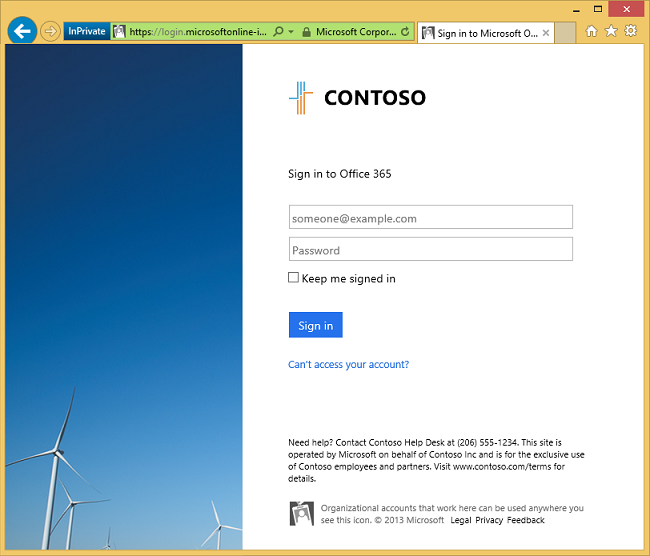 If they visit a service with non-tenant specific URLs (such as https://mail.office365.com) they will see a non-branded sign in page. The sign in page will refresh to show your branding once users have entered their user ID or selected a user tile. Your domain name must appear as “Active” in the Active Directory > Directory > Domains section of the Azure management portal where you have configured branding. 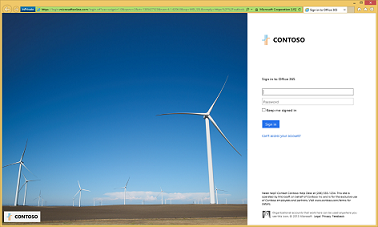 Sign in page branding doesn’t carry over to Microsoft’s consumer sign in page. 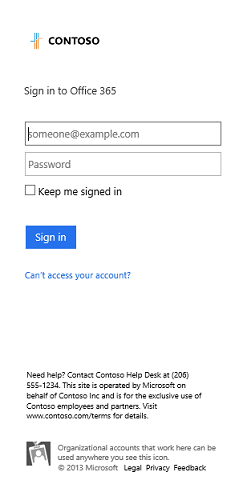 This means that users who sign in with a personal Microsoft account (formerly Windows Live ID) may see a branded list of user tiles rendered by Azure AD, but your organization’s branding will not apply to the Microsoft account sign-in page. What will my end users see once I have customized the Sign In page? If you want to show your company brand, colors and other Customizable elements on this page, see the images in the table below to understand the difference between the two experiences. What elements on the page can I customize? Shown at the top-right of the page. Replaces the logo that would normally be displayed by the destination site that your users are signing in to (For example. Office 365 or Azure). Shown at the left of the page. Replaces the image that would normally be displayed by the destination site that your users are signing in to. The Background Color may be shown in place of the Large Illustration on low bandwidth connections, or on very narrow screens. Shown above the page footer when you need to convey helpful information to your users before they sign in with their work or school account. For example, you may want to include the phone number to your help desk, or a legal statement. All elements are optional. For example, if you specify a Banner Logo but no Large Illustration, the Sign In page will show your logo and the illustration for the destination site (e.g. 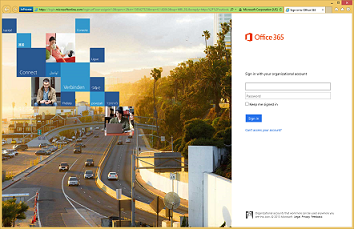 the Office 365 California highway image). How will the illustration appear after the browser has been resized? During a browser window resizing, the large Illustration, like the one shown above, will almost always be cropped to accommodate different screen aspect ratios. With this in mind, you should try to keep the key visual elements in the illustration so that they will always show in the top-left corner (top-right for right-to-left languages). This is important because resizing typically occurs from the bottom-right corner going towards the top/left or from the bottom towards the top. The following table shows how the illustration will be cropped, depending on the positioning of the resize. The Access Panel page is essentially a portal page for all end users that need quick access, via clickable application tiles, to the various cloud apps that you’ve granted them access to. If you want to use the default non-branded Access Panel page experience, you need do nothing. What will my end users see once I have customized the Access Panel page? Administrators can customize the Access Panel by replacing the default logo in the upper-left corner with an organizational banner logo of their choice, as shown in the figure below. This same logo will show on both your Sign-In and Access Panel pages. One default set of Customizable elements can be configured per directory in the Azure management portal. After defaults have been saved, an administrator also has the option to add localized versions of each element, for different languages/locales. All customizable elements are optional. For example, if you configure a default Banner Logo but no Large Illustration, the Sign In page will display your logo in the upper-right corner, however the site’s default illustration will be displayed. If you configure a default Banner Logo and Sign In Page Text in English, and configure language-specific Sign In Page Text for German, then users with a German language preference will see your default Banner Logo but the German text. While you could technically configure a different set for each language supported by Azure AD, we recommend that you keep the number of variations low, for maintenance and performance reasons. Use the following steps to add a logo or other elements to your directory. Sign into the Azure Management Portal as the administrator of the directory you wish to customize. Select the directory you wish to customize. Select the Configure tab, and then select Customize Branding. Use the following steps to add a language-specific logo or other elements to your directory. In the Azure Management Portal, under the Configure tab, select Customize Branding. Select Add branding for a specific language, select the language you want to customize the logo for, and then click Next. Edit only the elements for which you wish to configure language-specific overrides. Note that all fields are optional. If a field is left blank, then the custom default value will be displayed instead (or the Microsoft default if a custom default is not configured). Use the following steps to remove all company logo and/or other elements from your directory. In the Azure Management Portal, under the Configure tab, click the Customize Branding button. On the Customize Branding page, select the Edit Existing Branding Settings option and then go to the next page. For Banner Logo, click on the check box to Remove uploaded logo. For Tile Logo, click on the check box to Remove uploaded logo. For Sign In Page User Name Label, clear all text. For Sign In Page Text, clear all text. For Sign In Page Illustration, click on the check box to Remove illustration. For Sign In Page Background Color, clear all text. Click the Save button to remove the elements. If necessary, click the Customize Branding button again and repeat these steps for all language-specific branding that needs to be removed. All branding settings have been removed when you click the Customize Branding button and see the Customize Default Branding form with no existing settings configured. We recommend that you experiment with a test tenant before making changes in your production environment. The simplest way to verify if your branding has been applied is to open an InPrivate or Incognito browser session and then visit https://outlook.com/contoso.com, replacing contoso.com with the domain you’ve customized. Note that this also works with domains that look like contoso.onmicrosoft.com. To test the language-specific settings, you will need to modify the default language preferences in your web browser to a language you have set in your customization. In Internet Explorer, this is configured in the Internet Options menu. The Banner Logo is displayed on the Sign In page and the Access panel. (currently not used in the Sign In page) In the future, this text may be used to replace the generic “work or school account” pictogram in different places of the experience. (currently not used in the Sign In page) In the future, this text may be used to replace the generic “work or school account” string in different places of the experience. You can set it to something like “Contoso account” or “Contoso ID”. Ask your users how they usually refer to the work or school account you provide them with. This “boilerplate” text appears below the Sign In page form and can be used to communicate additional instructions, or where to get help and support. The illustration is a large image that is displayed on the Sign In page to the left of the Sign In page form. This image WILL almost always be cropped, to accommodate different screen ratios. Keep the primary visual elements in the top left corner (top right for RTL languages), because resizing will occur from the bottom/right corner, going towards the top/left, as the browser window shrinks. The Sign In page background color is used in the area to the left of the Sign In page form. This is visible either when there is no Sign In page illustration present.